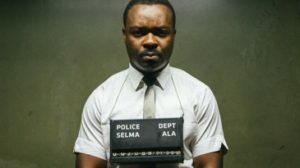 Acting Magazine | 3 Brilliant Portrayals of Martin Luther King, Jr. In honor of Martin Luther King Day, we’d like to highlight three brilliant, recent portrayals of this iconic Civil Rights leader. Dr. Martin Luther King Jr. (January 15, 1929 – April 4, 1968) continues to inspire us all with his lifelong fight for racial equality, social justice and world peace. His inspiring speeches and determination to bring change through non-violent means, has left an indelible mark on the world. In honor of Martin Luther King Day and Black History Month, we’d like to highlight three brilliant, recent portrayals of this iconic Civil Rights leader. In 2014, Selma was released, starring actors David Oyelowo, Tom Wilkinson, Carmen Ejojo and Tim Roth. The film centered around Martin Luther King, played by Oyelowo, and his efforts to nudge President Lyndon Johnson (Tom Wilkinson) to pass legislation that ensures the voting rights of African Americans. In the film, King travels to Selma, Alabama to fight for voting rights, culminating in a planned march from Selma to Montgomery. The march, however, is disrupted as activists attempt to cross the Edmund Pettus Bridge. The marchers are met by state troopers who attack them with tear gas, clubs and other weapons. The march to Montgomery was stopped, but media coverage of the event spread across the nation and around the world. President Johnson ultimately speaks to a Joint Session of Congress to ask elected officials to pass a bill guarantying voting access to all Americans. The Butler (2013) was an historical film, inspired by a Washington Post article entitled “A Butler Well-Served by This Election”. 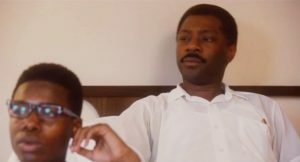 The film, which stars Forrest Whitaker, Oprah Winfrey, David Oyelowo and John Cusack, was loosely based on the life of Eugene Allen (portrayed as “Cecil Gaines” in the film), a butler who worked in the White House for decades and served many presidents in his 34-year tenure. In the film, Cecil Gaines’ son, Louis, is inspired to join the Black Panthers following the assassination of Martin Luther King. His decision would bring about a clash with his father who kicked him out of the house. Nelsan Ellis, the actor who portrayed King, passed away on July 8, 2017 due to complications from alcohol withdrawal syndrome. He was 39. 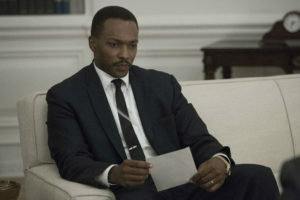 In HBO’s television film, All the Way (2016), Anthony Mackie plays King, as Vice President Lyndon Johnson (Bryan Cranston), ascends to the presidency, following the assassination of President John F. Kennedy. In the film, King, as he did in real life, puts pressure on Johnson to pass the Civil Rights Act in the strongest possible way, as Johnson navigates opposition from several groups, including from Southern Democrats. The bill is passed in 1964 after overcoming a filibuster. The film won critical acclaim and was nominated for 8 Primetime Emmys.